Portions of Alabama is flooded with heavy rains that started last Saturday and continued through Thursday. A total of 10” of rain overflowed streams, rivers and lakes. I’ve never seen Smith Lake this high and getting higher everyday. Full pool in this lake is 510, it is now up 518 and will probably go higher before the week is out. We are expecting more rain starting Thursday and through Friday. In fact the lake is closed at the dam where I launch most of the time. 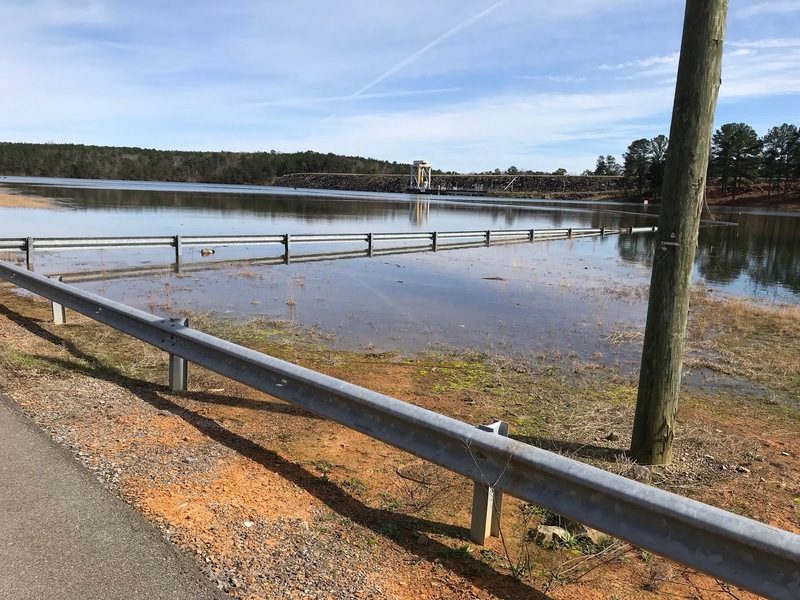 An Alabama Power employee told me yesterday that the lake will not open up again until the water recedes back to full pool. The tailrace below the dam is out for fishing as well because of the constant generation; I’ve really had it with the rain! My only choice to wet a fly was Walker Lake which was my destination for the afternoon. The lake was stained with all the heavy rains. I was fishing this same area two weeks ago with much clearer water. I knew it would be tough getting some hits today because the fish couldn’t see the fly as well. So the objective was to give the popper a little more action to get a hit. I’m a firm believer in changing flies if I’m getting no takes; that was the case for first 30 minutes. 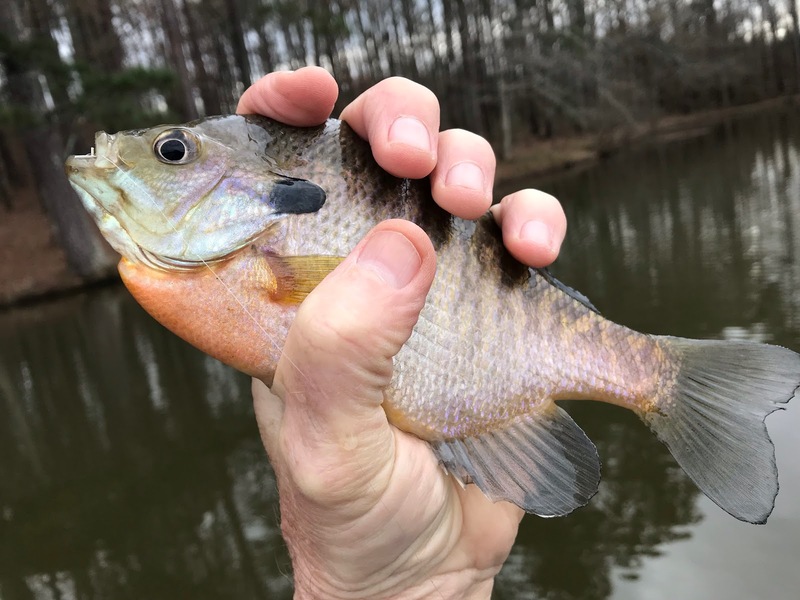 The first bull gill which hit the white Barr Nunn popper; notice you don’t see the popper because it is crammed in the gills throat. The white Barr Nunn popper was the popper that got the most attention for the rest of the afternoon. I was using my 2 wt and 3 wt 7 1/2 ft. Redington rods, which matched the size bluegills I was catching. The bigger bluegills never showed up today. What a difference in temps and weather, we experience in Orlando last week at Disney World. The temps were in the mid 80’s and high 80’s all week we were there. The best part of the trip aside from spending time with all the family was NO RAIN! Portions of Alabama is flooded with heavy rains that started last Saturday and continued through Thursday. A total of 10” of rain overflowed streams, rivers and lakes. I've never seen Smith Lake this high and getting higher everyday. Full pool in this lake is 510, it is now up 518 and will probably go higher before the week is out. We are expecting more rain starting Thursday and through Friday. In fact the lake is closed at the dam where I launch most of the time. 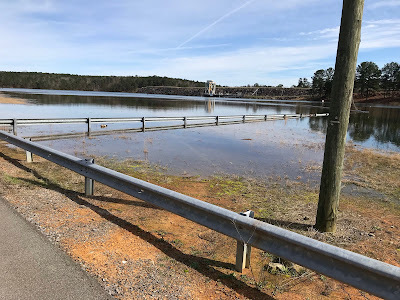 An Alabama Power employee told me yesterday that the lake will not open up again until the water recedes back to full pool. The tailrace below the dam is out for fishing as well because of the constant generation; I've really had it with the rain! My only choice to wet a fly was Walker Lake which was my destination for the afternoon. The lake was stained with all the heavy rains. I was fishing this same area two weeks ago with much clearer water. I knew it would be tough getting some hits today because the fish couldn't see the fly as well. So the objective was to give the popper a little more action to get a hit. I'm a firm believer in changing flies if I'm getting no takes; that was the case for first 30 minutes. 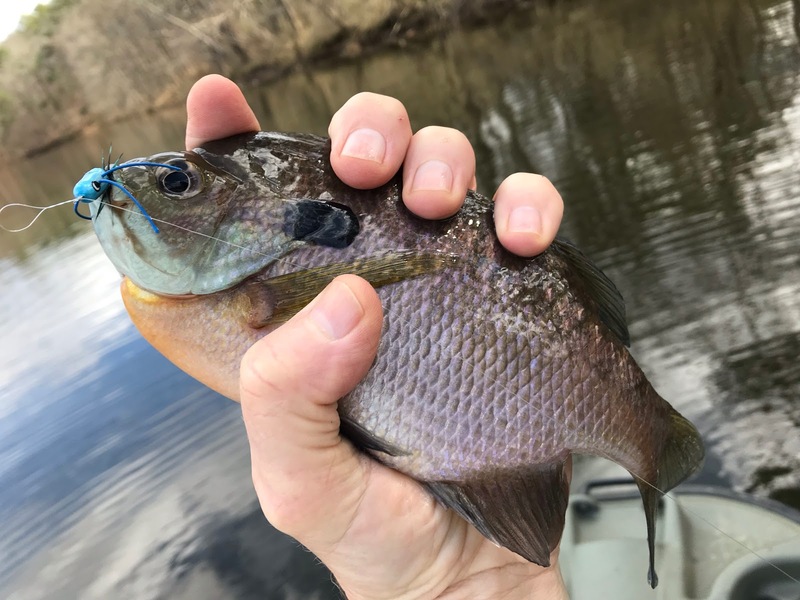 The first bull gill which hit the white Barr Nunn popper; notice you don't see the popper because it is crammed in the gills throat. The white Barr Nunn popper was the popper that got the most attention for the rest of the afternoon. I was using my 2 wt and 3 wt 7 1/2 ft. Redington rods, which matched the size bluegills I was catching. The bigger bluegills never showed up today. 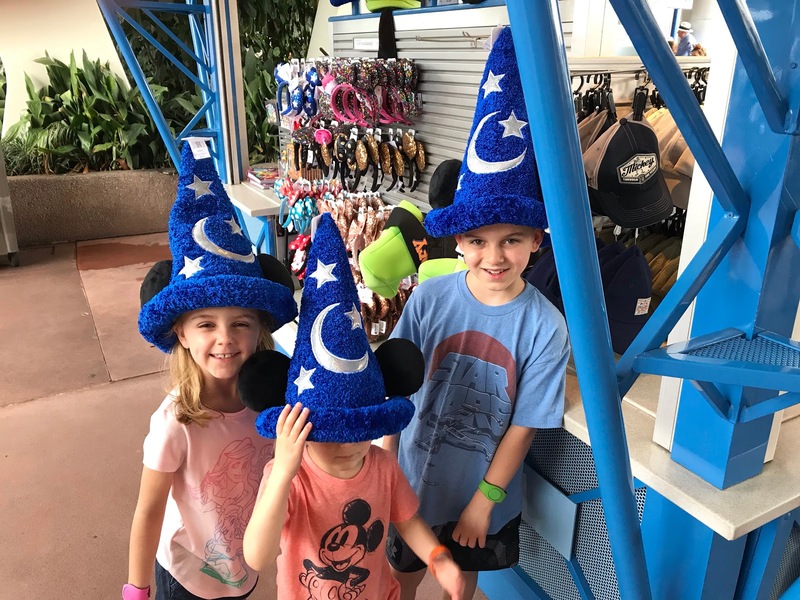 What a difference in temps and weather, we experience in Orlando last week at Disney World. The temps were in the mid 80's and high 80's all week we were there. The best part of the trip aside from spending time with all the family was NO RAIN! Why work with a Guided DIY Service? The IM10 Fly Rod is probably the closet I will ever get to fishing with a Tenkara Fly Rod. The IM10 is a medium fast action 10 foot, 3/4 weight, four piece nymphing fly rod. It weights in at a light 3 ounces. I seldom order a fly rod online but I took a chance on this one from Ebay because of the reviews, which were all positive. 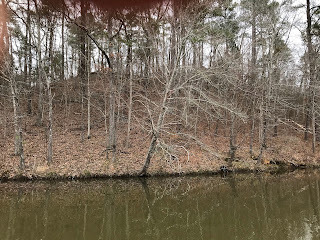 While fishing last spring and summer on the Sipsey I notice I needed a little more reach when nymphing the smaller pocket holes; my 9 foot Sreamflex just wasn't getting me the extra reach. This fly rod not only gives me the chance to nymph small areas easier but I have the option to use it for casting beyond tight nymphing areas. 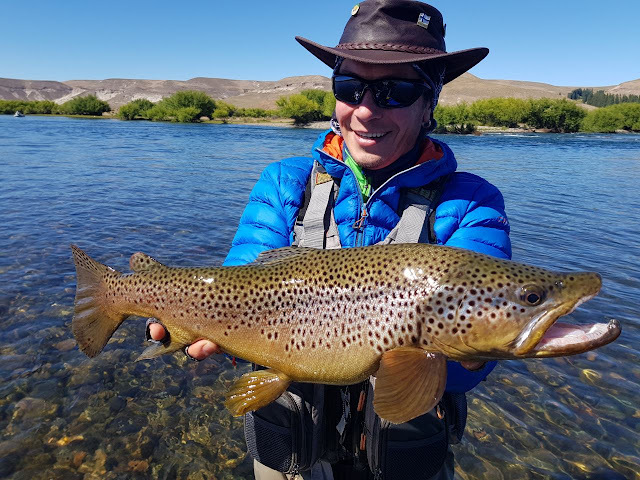 The quality on this fly rod is amazing, even down to the rod tube, alignment blank indicators, name tag insert, embossed fly pattern, extra rod tip blank and the beautiful designed reel seat. Couldn't wait to get out on the water and give it a test trail. It was an incredible 80 degrees in Jasper on Thursday so fly fishing was my top priority. 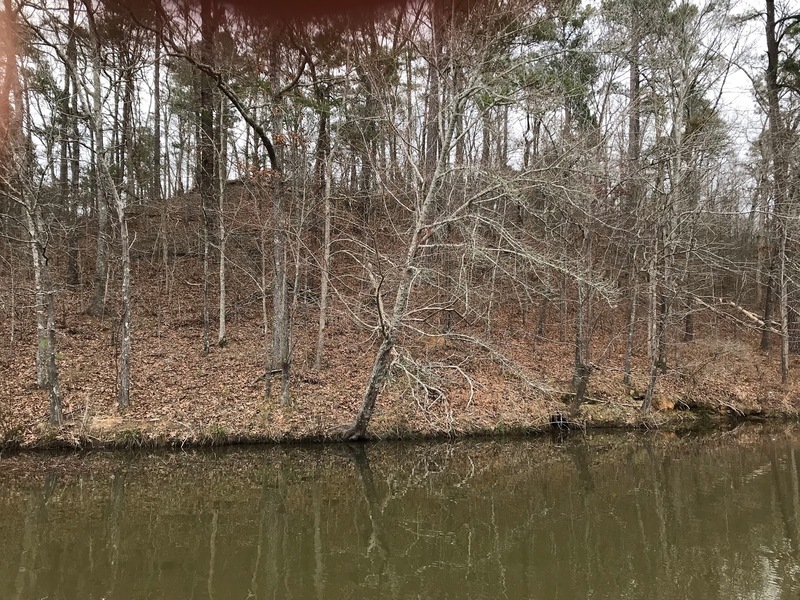 With my 10 ft. Pelcian loaded and my 10 ft. IM10, I started my bluegill quest on Walker County Lake. Everything was positive on this outing but the wind, which was horrendous at times even to point of water splashing into the boat. I had to cross the lake in white cap conditions. So glad I had the battery fully charge, which was not the case when I left the lake. Now to the rod review; the first thing I noticed was how easy it loaded the 3 wt. Orvis Clearwater Line paired with my Battenkill II reel. I was even more impressed with how fast the line straightened out on the water surface as I completed the cast. The medium fast taper action gave the right amount of bend action to make a small bluegill seem larger. Yet it still has the power to handle much larger fish such as the spots on Smith Lake. I knew the extra length would give me a longer cast and it delivered. I will admit it took a little time getting use to the extra foot compared to my 7,8 and 9 ft. fly rods. By the end of the trip the fly rod and I bonded nicely after landing a bunch of bluegill for the afternoon. Now the next test will be the Sipsey high sticking some of the pocket holes I like to fish there.